Ceramic filter grain and sand has the merit of steady function, anti-blasting, water resisting, strong heat resisting, uniform particle, damming the impurities very well, solving that problem that quarts sand is easily broken and muddy and come out SiO2 and leave over liquid coal. Ceramic filter grain and sand is widely used as filration medium in monolayer filtration pool, multi-layer filtration pool or mechanical filter to treat various industrial sewage, industrial water, city water, city sewage, pure water and soft water, or used as biological filter material to treat organic sewage. 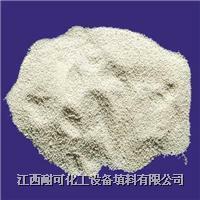 It can also be used as filter material in filtration dust remover to treat with various industrial dust and boiler flue dust.